Whos the benchmark? We are! 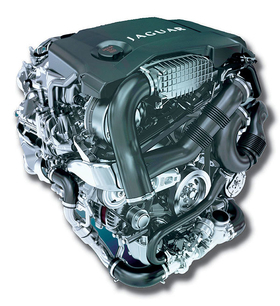 During the development process for its new-generation V-6 diesel and V-8 gasoline engines, Jaguars engineering teams were convinced that innovations in the 5.0-liter V-8 meant it was best in class for crank train friction. This factor is crucial to powertrain efficiency and fuel saving. Nevertheless, as a precaution, the company sent the engine to a prominent European engineering consultant with the request to explore ways of further reducing this friction. Soon, however, the engine was returned, with the message that nothing more could be done. It was already by some margin better than the others in its class, announced the consultant. And whats more, as a result of the V-8s frictional superiority the independent experts said they would have to redefine the class standard and advance the benchmark by a few notches.